A January Dinner Party – For a Birthday! Dinner parties are hard work if you try to do all the catering yourself. And they are made more daunting by the need to “perform”, given Australians’ growing knowledge and expectations about what is good food. Apart from working out a “modern” menu and doing the actual cooking, much time is also taken up doing the shopping, setting the table and then cleaning up and washing up afterwards. 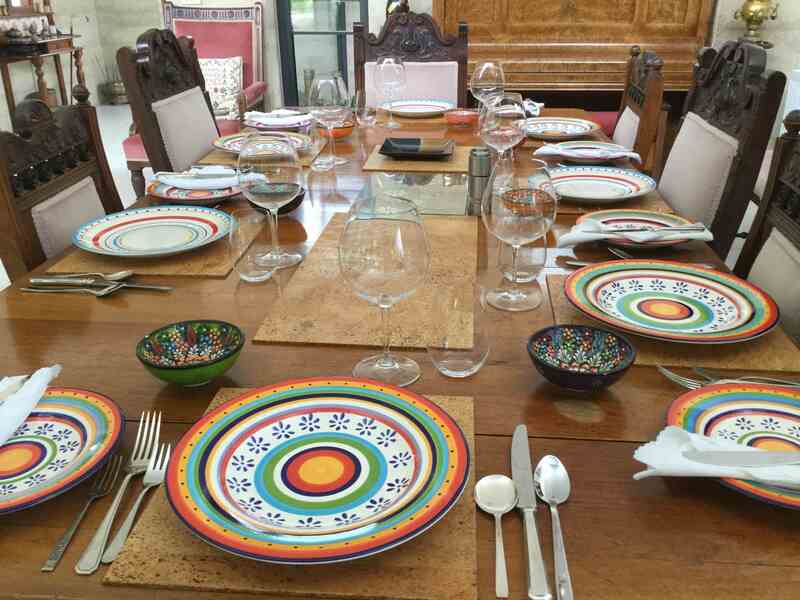 We still have dinner parties at home but we will often accept guests’ offers to contribute a dish. We are more pragmatic in other ways too, like avoiding using too much glass wear: a friend lamented that if you have dinner for six and they all have a sparkling wine, some still wine, perhaps a dessert wine, and water, then there are 24 glasses to wash up! Rhonda’s two sisters and their husbands live on the Mornington Peninsula. We make frequent visits there, and generally stay overnight. Rhonda’s birthday falls in early January and the six of us either go out for dinner or we eat at someone’s home. For the most recent occasion, we ate at Rosalie and Nat’s with all six of us contributing in some way. And we had a few invitees join us. A complication was that, on the night, most of us were attending a 6 pm concert as part of the Mornington Peninsula Summer Music Festival. We would not get back to the house until 7.30 at the earliest, so it meant practically all the preparation had to be done beforehand. Following is the family “menu” for the day, along with some recipes and/or guidelines for some of the dishes. Poached Atlantic salmon, shredded, in a dill and sour cream sauce. Rosalie had an abundance of beautiful basil in the garden so it made sense to make some fresh pesto. This Greek-based recipe from the island of Crete was given to us many years ago by our Danish friend, Peter. He came across it at a Greek cooking course and recommended it to us. It is not difficult but gives a lovely result. The olive oil and lemon provide the hints of Greek cooking; be careful not to overdo the lemon. 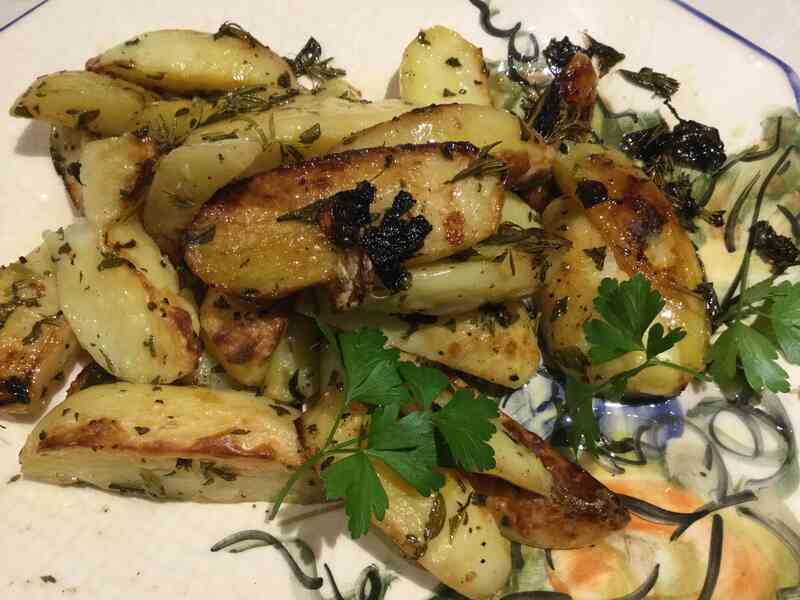 Slice potatoes lengthwise into quarters. Put in baking dish (and add garlic cloves if being used). Add herbs. Pour over oil and toss to coat potatoes, trying to keep the potato quarters cut side up, and with some herbs on top of each slice. Add lemon juice, squeezing over the cut potatoes. (Alternatively, add herbs by sprinkling over the potato slices.) Add plenty of salt and pepper. Bake at 200oC for 40 to 60 minutes. Serve: Serves 4 to 8 people. Rosalie has a vegetable garden that is abundant with salad leaves and herbs. They form the base of a salad using whatever she has on hand: finely shaved apple or fennel; slices of stone fruit or heirloom tomatoes; chunks of avocado; sliced spring onions; a vinaigrette with an extra flavouring or two, such as lemon myrtle. A perfect accompaniment for the potatoes and chicken we were preparing. This recipe by Dan Lepard from the Melbourne Age newspaper was the main dish of the night: Chicken tray bake with fenugreek, sumac and onions. 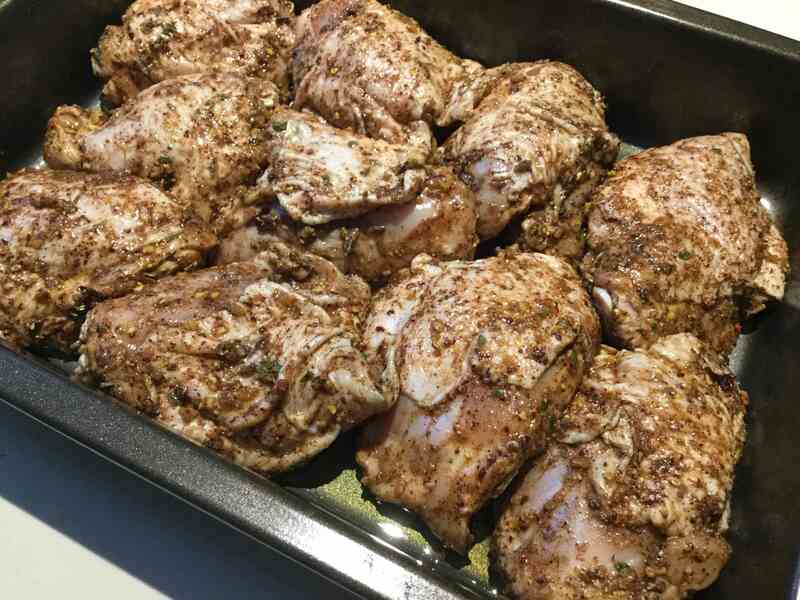 It is very easy and robust but gives a great result, one of the more delicious chicken dishes published in recent times. The onions are the real surprise in the recipe as they cook quickly but are a wonderful foil to the chicken. Follow the recipe exactly; we have nothing to add except to say that the chicken can be marinated longer. The following photo is of the chicken after marinating and ready to go into the oven. 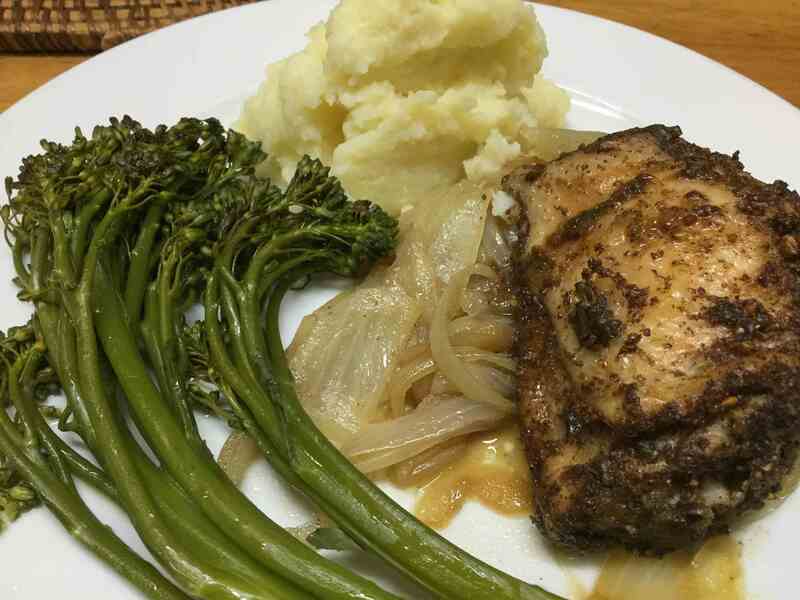 The photo after that was taken at another time and, while only “cook and shoot” quality, it shows the finished chicken with the onions, along with potato and cauliflower mash and broccolini, demonstrating the versatility of the chicken. Serves: Four to six. Serve with roasted potatoes and a green salad. Lorraine and Sasha used to run Poffs’ Restaurant at Red Hill. They haven’t lost their cooking skills since retirement. 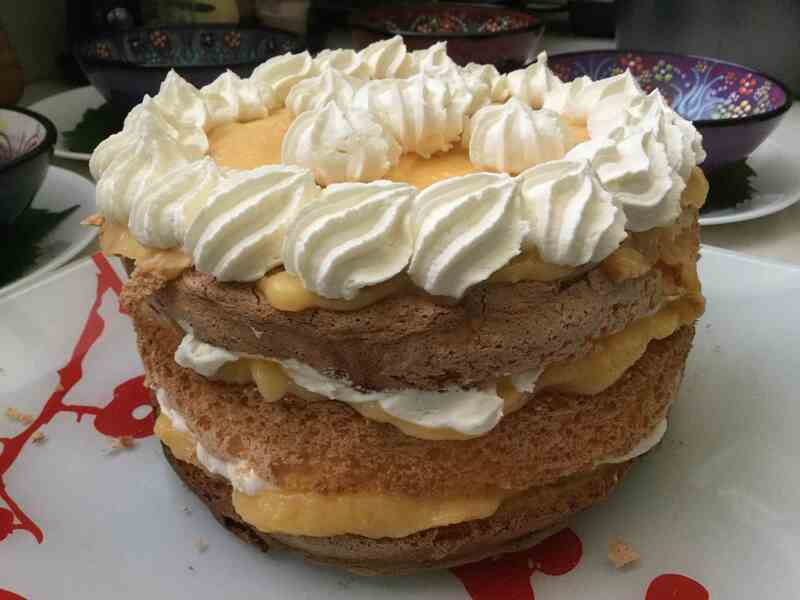 They make this inspired combination: a sponge cake filled with lemon curd and cream! Their preferred sponge recipe has a history of many decades: they use Nat’s mother’s. 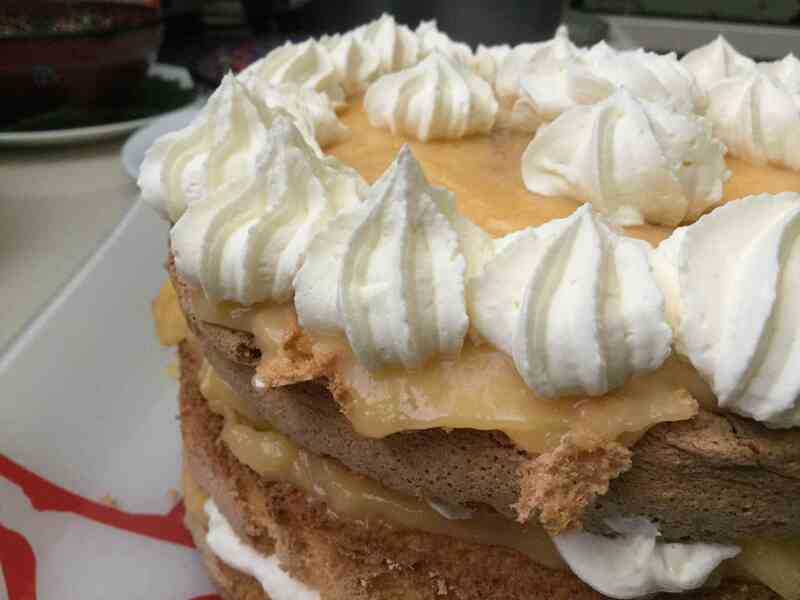 If you are scared of making sponge cakes, check the recipe and method below: it is not all that hard to make! You can make one large sponge and cut it up later, or make two or more from the same mixture. If you have a preferred sponge or curd recipe you could try those instead. You need quite a few lemons for the curd (and a strong wrist). You could use passionfruit instead, but not as much in volume and with some lemon juice included. Instead of curd, you could fill the sponge with berries or jam (conserve). Prepare your cake tin(s). You can make more than one sponge by using two (or more tins), but in this case we use a single springform pan of 22 to 23 cm diameter. Using baking paper, line the bottom and line the sides to about 3 cm above the top, as the sponge will rise a lot. Whip the egg whites until stiff and then start adding the sugar in stages until a thick meringue develops. Gently beat in the whole egg yolks and until all is thoroughly combined. Sift in dry ingredients together and into the mixture. (Sifting adds more air to the mixture.) Gently fold until smooth, but don’t over-mix. Pour the mixture into the tin. Bake for18 minutes until well risen and golden brown, turning if necessary. Cool then fill as desired with berries, cream, curd, etc. Add the juice, butter and sugar to a saucepan and bring to a boil – stir to melt in the butter. Remove from the heat. Whip the above together until firm enough to retain its shape when added to the cake. Using a serrated knife, split the sponge into three layers (except if you have made two or three separate cakes). Between each layer you want some curd topped with cream. It can be difficult to get the cream to spread over the curd. Try piping the cream, or use the method described here. Spread some of the curd thickly on top of the first cake layer. Spread some whipped cream onto the bottom of the next slice, then upturn on top of the curd. Repeat for the next layer. Finish the top with a layer of curd, then dot with cream. Serve: Serve 8 to 16. Degree of difficulty: 4/5 (Reasonably difficult) as sponges can go wrong, and curds require care.